There is now a growing swing towards lightweight adventure bikes. Manufacturers are now adding smaller capacity bikes to their Adventure Touring category. Whether you’re a new rider starting out or an experienced rider downsizing, there are now some great bikes available at the smaller end of the range. Ever since Charley Boorman and Ewan McGregor rode from London to New York in 2004 in the TV series ‘Long Way Round‘ the popularity of Adventure Motorcycle touring has skyrocketed. They had the backing of follow up vehicles, support crew, a cameraman on a third bike, and a sizeable budget for the TV show. Even though Charley was the more experienced rider of the two, they both struggled with the weight of the bikes and gear they were carrying, especially when the roads disappeared and the terrain got treacherous in places like Mongolia. Ewan and Charley’s first choice of bike was KTM, however, when KTM refused to supply them with bikes, BMW agreed to the deal. Their first choice of bike was the 650cc singles, but BMW insisted on the heavier 1200cc GS models. Ewan stated later that given the weight of the big GS’s that they would not have been able to make the trip without the assistance of the backup crew. 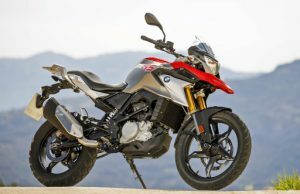 Without a doubt, they added to the sales of the BMW 1200GS models, and similar bikes from other manufacturers of large adventure bikes like Honda, KTM, and Yamaha. Adventure Motorcycle touring is now one of the fastest growing categories in the motorcycle industry. Riders these days are looking for a bike with comfortable on-road touring ability, off-road capability and performance all wrapped up in the one bike. Adventure riding is for riders who don’t want to transport their bike on the back of a vehicle. They want to walk into the garage, get on their bike and ride long distances on the highway in comfort, go into the forest and ride some forestry roads, some gentle trails, camp out for a night or two, and ride home again. Many riders who have bought large capacity bikes have found they have to downsize because they can’t manage the weight of the bike off-road. Remember you have to be able to pick the bike up after the inevitable fall on the trails. This is something you almost never have to do with on-road riding. If you crash a large bike on the road at speed, you have more to worry about than picking the bike up, like serious injury, ambulances, and hospital. Do you really need a large capacity adventure bike because you are planning a long adventure ride? 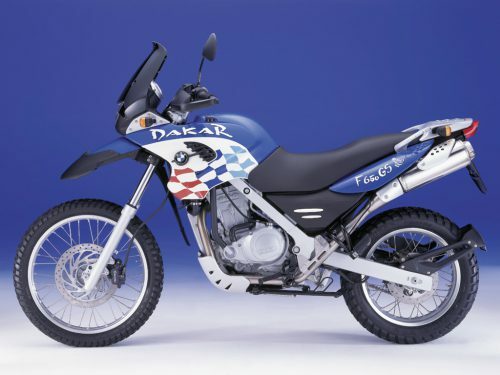 In recent years there has been an increase in the numbers of lightweight adventure bikes available. There are now bikes available from 300cc right up to 1200cc. When choosing a bike you need to be brutally honest with yourself about your riding skills off-road. The general rule is: the less experience you have off-road, the lighter the bike you should look for. Where will the majority of my riding be? Ask yourself what percentage of your time will be spent on-road, and what percentage off-road. Don’t allow yourself to be pressured by your friends into buying a 1200cc bike because they have one. If you’re coming from a road riding background, you may be tempted to stick with a large capacity adventure bike for the on-road comfort, but there are some smaller capacity adventure bikes that have windshield protection and a comfortable seat for long highway sections. If you come from an off-road background, you will be more comfortable with the lighter weight bikes, but looking for something with a better on-road capability than your Dual Sport or Enduro bike. The swing to smaller capacity bikes will open up a whole new world for the less experienced off-road riders, women riders and shorter riders who find the taller heavier bikes unmanageable. 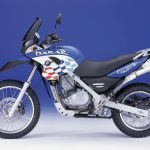 So what is available in the Smaller Adventure Bike Market? Let’s look at a couple of new additions to the ‘Baby’ adventure market. 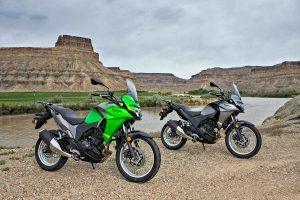 In 2017 Kawasaki came out with the Versys-X300. 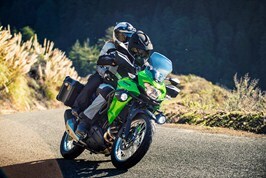 At 300cc it is Kawasaki’s smallest capacity model in its adventure-touring category. It is learner approved and still more road than trail, but at 170kg (374 pounds) is light enough to handle moderate dirt and gravel forestry roads. The bike has a large tall windshield which adds comfort to long road rides and gives it that adventure bike look. It has a fairly comfortable seat but it is reported to become uncomfortable after 2-3 hours riding, so an aftermarket seat is an easy fix. It comes standard with the luggage rack for securing your top box and panniers. There is a wide range of accessories available from Kawasaki. The ABS braking cannot be turned off for off-road use, but you can opt for the non-ABS version and save yourself $300. While not designed specifically for off-road use, the 19″ front wheel and moderately long travel suspension (5.1″ front and 5.8″ rear) gives it greater capability on unpaved roads. Riders looking for more suspension travel may not be happy with this, but the advantage is that it gives the bike a low seat height of 32″. The Versys-X300 is a great entry level bike that will give new riders an exciting ride on pavement as well as forestry and dirt roads. 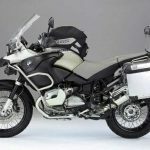 BMW has now launched the BMW G310GS. It is the smallest addition to the popular GS range. The bike has a low (32.8″) seat height and 168kg (370 pounds) weight, making it ideal for new riders. The larger 19″ front wheel helps soak up the bumps off-road, and longer travel suspension (7.1″ compared to 5.5″ on its roadster brother, the G310R). It comes standard with a small windshield and a luggage rack that can accommodate the factory BMW top box. The ABS can be turned off for off-road use. If you’re new to motorcycling you will have little to complain about with this bike. It is more suited to the new rider, rather than the experienced rider downsizing from a larger bike, who will find the street performance limited. On-road, it is fun and easy to ride, and will make a good commuter. Off-road, if used as it’s designers intended, it is fine for light off-road riding. If you’re looking for a cheap, fun way to join BMW’s growing GS family, here’s your chance. So whether you’re downsizing, or getting into motorcycles for the first time, these two bikes may be worth a closer look. It all comes down to where the majority of your riding will be, and if riding off-road, the type of terrain you’ll be riding. 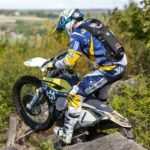 Austria To Egypt – On Lightweight Enduro Bikes? 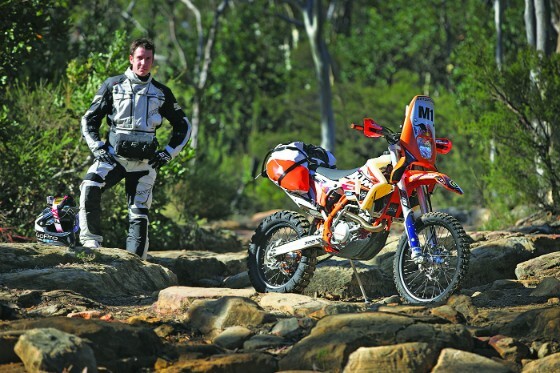 Two KTM 500 EXCs were the bike of choice in the Motology Films MOTONOMAD trilogy. Adam Riemann and his mate Mark Portbury chose to use competition enduro bikes rather than a heavier purpose made adventure bikes to complete a 7000km trip from the KTM factory in Austria to Egypt. MOTONOMAD III – 7000 km through Chile, Bolivia, and Argentina, following an old route of the 2014 Dakar Rally. Do you own a lightweight adventure bike? Have you downsized, or is it your first bike? Please feel free to comment below and tell us about. This reads just like a conversation between friends, great job. I can tell you are passionate about riding bikes. My nephew was into off-road dirt bikes a long time ago. Great description and tips on the bikes. It’s great to know that the seat on the Kawasaki Versys-X300 will become uncomfortable after 2-3 hours of riding. I’ve know a few riders to stay out all day. 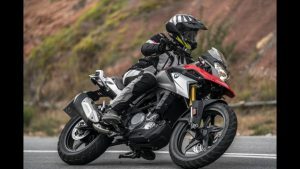 I am short and would be a beginner so I like the BMW G310GS best. Hi Candice, thanks for your comments. I agree with you, I like the BMW too. It would be perfect for the new adventure rider and sure looks the part. It’s hard to believe it is only 310cc. It looks like a much bigger bike. Hey there! How are you doing? 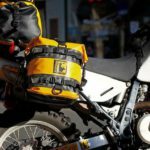 I’ve really enjoyed reading this article on “Are Big Adventure Bikes Really Necessary?” as you’ve provided us with lots of useful information. Firstly, I think they are necessary and I totally agree with you. 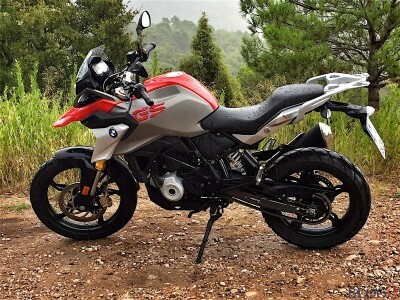 My personal favorites of all the bikes you’ve listed is definitely the BMW G310GS because I’ve been a big fan om BMW bikes and love the way they engineer and design their bikes. How much does this cost? Do they also have a good warranty? Thank you in advance for answering my questions. Keep up the good work! Hi, glad you enjoyed the post. The BMWs are very popular, you can’t go wrong if you get one suited to your experience and type of riding you will do. Cost all depends on the model you choose and whether its new or used. There is a warranty if you buy from a dealer. You also get the after sales service and backup. Thanks for dropping in. Let me know if I can be of any more help. Thank you for sharing with us this great post on lightweight Adventure.I have never seen attractive bike until I got into bike race situation when I was travelling .I was amazed to see how riding a bike is a very good and decided to take a bike riding class. In my country,women are not used to ride bike but I am doing my class very well and my coach told me that in 3 months I will be able to ride well a bike. If I succeed to get a driving licence,my dream is to buy a bike which will help me to go to work without waiting for bus. Hi Julienne. It’s fantastic that you are doing a riding course. It’s important to learn the basics first, it will save you a lot of trouble later. Hope you enjoy it and good luck with getting your license. Hi Henry. Yes, it’s very easy to be tempted to buy a big heavy bike for the road, but it’s a whole different story off road. These days a 350cc bike has as much power as a 500cc did 20 years ago. You just have to look at where most of your riding will be. I enjoyed reading your post and enjoyed watching the 2 videos you embedded. To be honest I am really worried about the weight of the bikes and I always prefer the lightweight bikes. I am less experienced off-road rider and I am planning to buy a adventure bike in a few months and your post is very helpful. I am a fan and lover of BMW so I am happy to see it on your list and The BMW G310GS is my choice. Hi Paul. Yes, you can’t go wrong with the BMW. Great that you’re getting into Adventure Riding. I’ve done a few trips recently on a BMW F650GS Dakar. Great for on and off road riding. Biking has really been a growing passion for me. And you have just given me another reason to look into getting a bike for myself. This BMW G310GS will be a perfect fit for me, seeing it’s good for both on-road and off-road purposes. My Cousin bought me a Kawasaki last year but really I don’t like it. I even prefer associating with the name BMW. I’m gonna sell my Kawasaki and buy this BMW G310GS. Thanks Greg for this great insight.